Now, I don’t want to jinx things, but I’m feeling pretty good… 37 weeks pregnant is officially the ‘fully cooked’ stage and if this one comes early, then her lungs should be mature enough to function without help. At my last scan the doctor said her head was down, but she wasn’t engaged, so I think we have a bit of time. And I’m using this time to work as much as possible, so I can afford to take as much time off as possible after she arrives (ah, the joys of freelancing). I have, however, made time to go for some reflexology – I nearly wept at the pleasure – and, after reading my last post when I sounded a bit… fraught, Isla from Beyond Nutrition kindly invited me to her JLT clinic for some Reiki. I was, as ever a little skeptical, but with an aching body and an overworked mind I needed a bit of help. Isla is also a physio and prenatal PT, so she gets the physical side too, and I spent a very happy hour in her care, as she ‘unblocked’ energy flow, paying special attention to my head and pelvis. As the mother of a sleep-allergic toddler, I had a nap, and woke up SO relaxed. In fact, since my visit I’ve been remarkably calm, my to-do list isn’t terrifying me as much as it should, I just feel lighter. 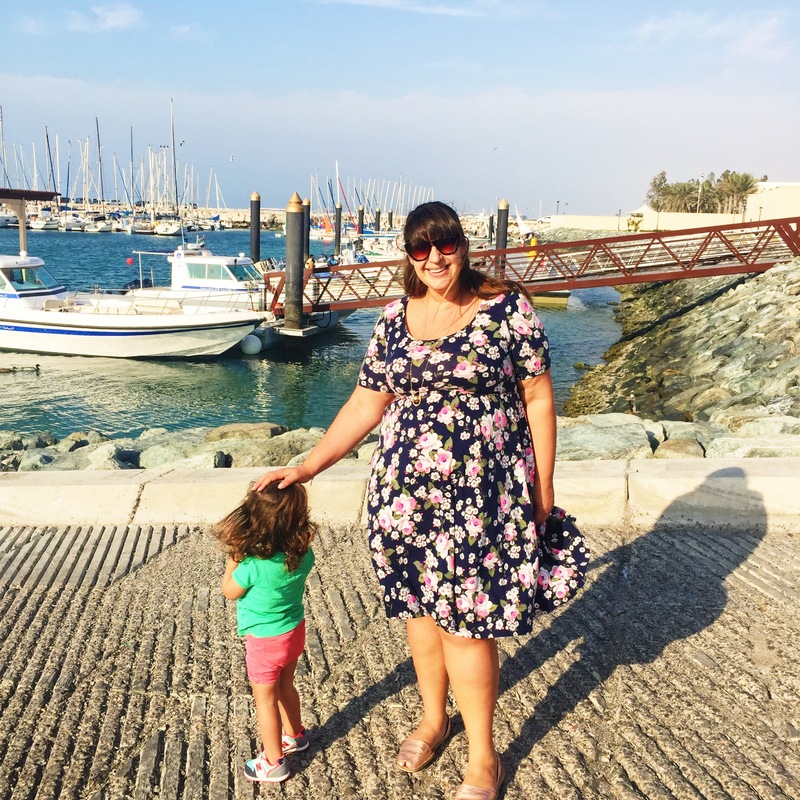 Not to be underestimated in the final month of pregnancy…! Isla is absolutely lovely, and you can learn more about her services here. Don’t get me wrong, I might be feeling well, but I’m not wearing high heels or structured fabrics, going out past 8pm or being particularly active. I’ve become very… fond of sitting down. And leggings. And eating cottage pie while watching The Good Wife. This week, you may expel the cervical mucus plug, aka “bloody show,” at any time. If you’re worried about stretch marks, be patient. They’ll begin to fade a few months after you deliver. Stretch marks are caused by broken collagen fibers under your skin’s surface. The strength of your collagen is genetic, so if your mom got stretch marks, you probably will, too. I keep threatening to show my husband Google Images of ‘the bloody show’. It tends to get him moving pretty quickly when I want something from the kitchen. As for stretch marks, I’m trying to keep them at bay with Bio Oil, which is costing me a small fortune. The hormone relaxin is causing all of the smooth muscle in your body to unclench. You’ll feel like you have loose “rag-doll” joints. You’re probably having Braxton-Hicks contractions, which you may or may not notice. How can you tell these contractions from the real thing? If you have to ask, they probably aren’t. Real contractions grow progressively stronger, more intense, and more regular. Yes. Lots. At night. Not what I need. The bag is pretty much packed (check out my checklist here). How old is this article? Phone book? Actually chuckling away to myself. Does the author have a birthday book too? Hang on, does everyone have one, and I’m the only person who relies on Facebook? Don’t answer that. The house is pretty much ready. The much-loved Moses basket from the first time around has been used for storage over the last two years, so was donated to charity, and we’ve replaced it with a Chicco Next 2 Me cot with a Sleepyhead, after listening to numerous friends rave about them. I got them from Mumzworld, and you can get 10% off your online shop (apart from a few products like diapers and formula) using my code MOTHERSHIP10 at the checkout. You’ll also find my pick of the site here, from pregnancy must-haves to the products that have (almost) saved my sanity over the last few years. We have a scan on Saturday, and I need her to stay in for just another week or so because a) it’s half-term at Phoebe’s nursery – worst timing ever b) I’m on a big deadline and c) I’m not ready. You might also like… Tried and tested: the new Ocarro stroller from Mamas & Papas.